← Bible Answers: Why Did God Accept Abel’s Offering and Reject Cain’s Offering? (Ver 1.1) This is Part 1 in a series of basic Bible lessons on the infinitely important subject of God’s Divine Grace. The subject of Divine Grace is by far one of the most significant found and emphasized by God in the New Testament but also one of the most misunderstood, overstated, exaggerated and unbalanced modern messages that I have found on TV, the internet and in many churches. Any subject in the Bible can be taken to a position of errant inaccuracy causing the underlying true message to become lost. Departing from a well-studied, thoroughly balanced, rightly divided, sound doctrinal view of God’s Word is a very dangerous but prevalent reality found in the church today. The subject of Divine Grace is just one of these subjects found in the present church that has experienced this sad fact of extremism. Many modern extreme Grace Bible teachers only teach a slanted selected fragment of the complete subject ignoring the rest of the Bible concerning sin, repentance, forgiveness, the fear of God, judgment, faith, holiness, sowing and reaping, deception, spirituality, carnality, being sprit led and the many other N.T. subjects which all must be taken into the full discussion equally. Instead of doing this these Bible teachers are working very hard to explain these complementary subjects away or totally ignoring them all together. I refuse to take that kind of narrow minded approach to such a broad important subject with so many other associated and linked matters being overlooked. I will warn you up front that this will be one of the most significant Bible lessons never taught by many modern Bible teachers on the subject of Grace. In fact, it will be so different that I may expect to receive several negative comments from my religious carnal readers who do not wish to see the spiritual truth of God’s Word. I ask that you open your mind and spirit to receive from what the Bible has to say on this subject. I’m going to begin this Grace Bible lesson series with an introduction to another very important Bible subject called “the fear of God”. In this part of the Bible lesson I will be using a personal testimony from my life experiences that God used to help teach me to see things differently in the Bible about the subject of Grace than many other Christians. Why am I starting a lesson on God’s Grace with the subject of the “fear of God”? That is a great question and the reason that I do this is because this subject is so consistently ignored that it has become lost to the modern Christian. In teaching with this approach I will have to battle an apparent Biblical surface text contradiction. The subjects of the “fear of God” and “Grace” appear to be in direct opposition to each other. Why should I fear God if God has given to me this free gift of divine grace and forgiven all of my sins? Because people do not know how to correctly balance two opposing subjects is the primary reason they choose to ignore the one they do not like. You are about to learn what these two directly opposing subjects mean when joined together correctly if you decide to continue to read the rest of this lesson. From a primary φέβομαιphebomai (to be put in fear); alarm or fright: – be afraid, + exceedingly, fear, terror. This Greek word occurs in 44 verses of the New Testament. There are 14 verses in the Gospels, 5 verses in Acts, 3 verses in the apocalyptic book of Revelation and the rest (22) in the letters written to the church. G5401 is not a superbly popular word but it is well distributed throughout the N.T. and therefore should not be ignored. I will begin my discussion of this Greek word by saying that I believe God’s definition of fear is based upon human awe and respect of His great power but that is not a complete and accurate definition based upon this Greek word’s usage. I certainly do believe that a reverential fear of God is a very healthy part of a real Christian’s relationship with God. I also believe that this reverential fear of God is a requirement and not just an optional condition placed in the mind of those that do not wish to see the truth. Those that wish to explain away the subject of the fear of God do so by stating this fear is nothing but “reverence” and that is by far not an accurate representation of the word’s definition as you can see. Reading from the Greek word definition given to us by Dr. Strong this Greek word means more than just giving God respect and goes to a deeper human response level of being afraid, to become fearful or even to be in terror of. How does that fit your relationship with God? I personally believe that if you have no real fear for God or of God then you really do not know Him very well. God is described to be omnipotent and this simply means “all-powerful”. Do you believe anyone else is more powerful than God? I certainly do not believe that anyone else is even close. Since you or I are not omnipotent it would be very foolish of us not to be in total awe of Him that is. The Greek word G5401 or the Hebrew word H3374 translated as “fear” can be researched in the Strong’s dictionary/concordance to verify how they are defined and used. Doing this research, will help us to better understand what these words mean. For example, when Jesus came walking up to the boat with the disciples on the water in the darkness of night, they were described by God to be in “fear” (G5401) crying out “it is a ghost”. Can you put yourself into their position and think how you might have reacted? Does that story help you to see what this word “fear” means? This word “fear” means to be un-expectantly terrified because this is not a normal/natural situation found in this life. Matthew 14:26 describes this event and God uses this same Greek word G5401 to describe how the disciples reacted. This Greek Word we will soon discover in the other parts of the N.T. is used by God to describe how we should react to God. I will give you several examples to help you learn how God uses this word when speaking of Himself and our reaction to Him and His works. It would be very wise of you to verify everything that I will say to you today for yourself using your own Bible and Strong’s dictionary. Is “fear” always a negative or can it ever be viewed as a positive emotion or reaction? What about physical pain? Is physical pain a positive? Can we agree that God created fear and pain as possible human benefits? If God created the response of fear and the feeling of pain do they have a purpose for existence? Is this purpose for our benefit or for our harm? I believe that fear and pain should be viewed as positives and not a negative aspect of our life or our relationship with God. You see if you did not have the sensation of pain you would not know to take your hand off of the hot stove. Likewise if you do not fear big trucks and step out in front of one moving very fast, you could be found dead in just a very few moments. Having fear of a greater power is healthy and normal and we should respect anything or anyone that is bigger than we are if we want to live a long well life. But, this subject fear and terror is still a potential major conflict for the God revealed to be Love who displays and extends us Grace in the New Testament. 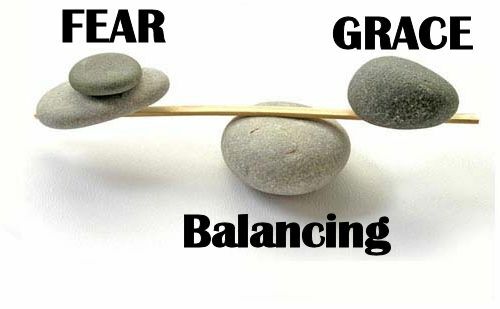 How do we balance “fear” with “love” and “grace”? Heb 12:9 Furthermore we have had fathers of our flesh which corrected us, and we gave them reverence: shall we not much rather be in subjection unto the Father of spirits, and live? This description is exactly what I was attempting to teach. We should learn to respect our God because He loves us enough to bring us correction. This Greek word for reverence is not “fear” but it contains implied fear in order to give someone reverential status. God is basically informing us that we need to become aware of His correction in our lives because this is just a normal part of the healthy relationship between the teacher/master to a lesser student/disciple in need of guidance. Perhaps you do not believe that you need any divine guidance and that will become your downfall soon. The Bible very clearly tells us that “those that are LED by the Spirit of God, they are the sons of God” (Rom 8:14). How can anyone lead someone else without also bringing correction when they stray from the instructions? I do not see how that is possible so pay attention to what God is teaching us. We need to learn from the parent analogy that fear, correction and judgment coming from God is a necessary and healthy part of divine power, grace, love and guidance. Without all of these subjects being found present there is no need for any of them. I’m not sure if you understand what I just said, but it was very profound and important. Numerous teachers today in the modern Grace message teach that every sin is completely covered by the shed blood of Jesus (TRUTH) and that there is nothing that they or any other Christian can do by omission or commission, good, bad or indifferent that will cause them to depart from God’s Grace or to fall under God’s divine judgment (LIE). In other words they are teaching Christians that God never judges them because He has judged Jesus and therefore, God does not love them enough to bring them any correction for their ways. They have foolishly taken the truth reality of the perfection of Jesus to mean that they are now perfect because of what Jesus has done for them and that is definitely not a sound Bible truth. This very popular belief places all of the responsibility of us remaining a Christian on God and omits any human influence, participation, contribution, responsibility, freewill choice or satanic involvement for deception. This extreme grace doctrine is simply a newer modified version of a very old doctrinal lie called “Once Saved Always Saved” (OSAS). They have placed salvation and eternal security totally and completely in God’s hands while ignoring what God says in His Word for us to do after we are saved. I always ask them, if God controls the outcome of the Christian race then there is no need for our effort to run in it (Heb 12:1). Therefore, there are no consequences for quitting, no disqualifications for cheating, no need for correction and certainly no need to fear God. That doctrinal belief sounds satanically inspired to me and I pray that you begin to see it in the same light. Eternal security and divine personal safety are both valid parts of the N.T. Gospel message but they are not everything that the Spirit of God taught me from my life experiences or from what is written in the Holy Bible. Try not to misunderstand what I just said. We do not base our faith or our beliefs of God solely upon our personal experiences in this life, but we can use them as examples if they align with the words of God in the Bible to teach others a lesson. That is what I will attempt to do today. I’ll tell you about what happened to my family and then you can judge if I am speaking the truth or if I am just here trying to deceive you. Will you do that? Can I count on you to be an unbiased, just and fair judge of what I teach you today? When I was a young man my father and mother went to a Bible school here in the United States. They were in their second year of Bible training with a great man of God teaching the class when suddenly the Holy Spirit interrupted the class giving the Bible teacher a supernatural spiritual vision. This Bible teacher saw a cloud of death hovering over the head of just one student in class and that man was my father. This vision from the Holy Spirit was a warning sent to my father. The Bible teacher being very concerned stopped the class and called my father to the front and prayed for him and asked him to come see him privately in his office later. My father basically did not understand the importance of what God had just tried to do for him and he ignored the request to come see the man of God privately. My father’s refusal to become obedient was the continuation and not the beginning of the downfall of my father. You see when the man of God gives anyone a message from God and they disobey it, they are not disobedient to the messenger but rather to God and His message. A few weeks later my father collapsed at home, was rushed by ambulance and went into a coma at the local hospital. The doctors did the best they could to save him but my father died suddenly in the hospital as a young man in his forties and never finished that year at Bible school. All of this happened despite the fact that my father was a Christian, the pastor of several churches, the graduate from one 4 year Bible College going to another Bible school to further his education of God and the Bible and all of us living in the church age called the dispensation of God’s Grace. I do not believe that my father was not a Christian or that he did not go to heaven when he died. I am convinced that he was born again and a Spirit-filled preacher man. But the fact that God gave another Spirit filled preacher man a clear vision to help warn my father of what was going to happen weeks before it happened is a major problem for the modern “no fault”, “no fear of God”, “no responsibility”, “no sin”, “no repentance” and “no judgment” Grace message. Every time I hear some preacher trying to tell me what people do today doesn’t matter for them being a real saved Christian living long in this world causes me righteous anger knowing what I know now about my father, God and the Bible. I believe you can see why I feel this way but let’s continue to read the end of the story. My family and I learned the rest of the story after the funeral. The man of God that was given the vision’s warning told my mother privately that God had showed him that my father was in sin not walking in love towards certain people. This man of God was shown what to tell my father to instruct him to change in order to not die this premature death. My father being a young man was definitely not in the season or time for his death. Since my father showed no fear and ignored the warning and did not humble himself to go and get the message from God, he died exactly as it was shown to the man of God. Some will try to say this was not a warning but a prophecy for something that could not be changed. Others will try to say the preacher lied about the vision or that my father was not really a Christian. Some will try to tell you that my mother lied to me and that none of this really happened this way. That is what one extreme grace preacher tried to tell me and then he unfriended me on Facebook like a real Christian brother would do walking in love. He definitely did not want to hear the truth but that is his choice and it will become yours shortly. I stand by everything that I just said, and I can show you the death certificate, let you listen to recorded testimonies and name every name that was involved giving dates and locations, but what difference would that make if you don’t want to see the truth. 2Ki 20:1 In those days was Hezekiah sick unto death. And the prophet Isaiah the son of Amoz came to him, and said unto him, Thus saith the LORD, Set thine house in order; for thou shalt die, and not live. 2Ki 20:3 I beseech thee, O LORD, remember now how I have walked before thee in truth and with a perfect heart, and have done that which is good in thy sight. And Hezekiah wept sore. 2Ki 20:5 Turn again, and tell Hezekiah the captain of my people, Thus saith the LORD, the God of David thy father, I have heard thy prayer, I have seen thy tears: behold, I will heal thee: on the third day thou shalt go up unto the house of the LORD. 2Ki 20:6 And I will add unto thy days fifteen years; and I will deliver thee and this city out of the hand of the king of Assyria; and I will defend this city for mine own sake, and for my servant David’s sake. I hope that you can see that the previously prophesied demise of the king was changed and Hezekiah’s life on the earth was extended by a further allowance of God’s Divine Grace. God said to His prophet to go back and tell the king that I have heard his prayer and saw his TEARS! That was a clear sign of the king reaching out to God with an attitude of repentance asking for forgiveness. Didn’t God initiate His divine grace to Hezekiah by first warning him about his death before it happened? If God would have kept silent and given him no warning the king would have died and that would have been justice for his sins. It is very clear to me that it was not the warning sent from God that was going to kill him. It was the warning sent from God that was designed to help the king make the necessary corrections. This is exactly the same truth for my father’s story. God’s warning was intended to turn my father around like King Hezekiah. Do you understand this point of the existence of God’s grace in these warnings? You will find this truth becoming clearer as we continue to study this subject. Grace will always be God’s initiated involvement in our life especially when we do not deserve it. What happened after the warning was initiated by God? Isn’t the continuation of further Grace placed into the hands of the men that were warned by God? You see I view the subject of Grace to be like a heavenly/earthly tennis match. I see God always serving the first Grace Ball at humans, but then it is the correct human response to this serve that determines another round of Grace. Please do not accuse me of blasphemy for reducing God’s Grace to be like a tennis match. I am simply attempting to teach you the fact that there is always God’s Grace that is extended first, followed by man’s reaction to that grace and then if it is appropriate in God’s eyes, God will extend them more grace. Didn’t God show the king additional grace and mercy by changing his prophesied future? I believe He did. This lesson of Hezekiah is definitely a valid story of indirect or unstated divine grace and that is why I am including it today in this lesson on grace and the fear of God. Can you agree with me that what God did for this O.T. king was an undeserved gift and an act of His divine grace designed to help avert disaster? If yes, what was missing from my father’s life story that was different from this King’s story? Both men were in a covenant with God and both were sent a prophet from God with a message for their coming death. But one man in the Bible believed the message in fear and sought God diligently and the other obviously did not. You have to throw the Bible away and simply call me a liar for telling you this story that happened to my father well over 30 years ago. The man of God must have made up the vision to his Bible class, my father, and my mother which started this whole chain of alleged deception. My mother then propagated the alleged lie to me and the alleged deception of Satan is continuing by me telling you the same story. That is certainly one way of looking at it attempting to explain it away if you do not want to believe the truth. I give you no proof or evidence for what I just told you other than this corresponding lesson from 2 Kings. You are now going to be forced to judge if these stories that I just told you are true or not. Start with the Bible story and determine if God lied? Then review the links of the Bible to the story of my father. Finally, consider the following questions. What is my motivation for telling you this story of my father? Can you think of any benefit that I gain from it personally? If I do not gain anything from telling these stories then consider how or what you would either gain or lose from knowing them and believing them or rejecting them? How, would these stories cause you to be deceived to not know the real truth? What benefit would be gained by Satan over you if what I said is true and you don’t believe it? Then reverse that question and say what benefit would Satan gain over you if the story is false and you do believe it? You really need to use your brain and think when you read my Bible lessons. I just can’t do your thinking for you! What advantage does Satan gain if you believe the modern extreme Grace message that teaches us nothing we do matters in this world? I can see that Satan’s major advantage is your ignorance of the truth. You need to learn the truth or this lack of knowledge might be the open door that allows Satan to take you down. The fear of God must be present to receive God’s initial grace. Faith in God’s Words must be present to receive God’ initial grace. Faith in God’s messenger/prophet is also a requirement to receive God’s initial grace. The humility to admit your error must be present to receive God’s initial grace. Asking God for forgiveness must be present to receive God’s additional grace. Repentance and change must be present to receive God’s additional grace. God’s grace is conditionally extended to man based upon their correct human response. Greater extensions of God’s grace are a progressive reality based upon correct human attitudes, responses and corrections. Grace can be rejected and lost by no fear of God being present, wrong human beliefs, wrong attitudes, and human pride. The first eight truths in my list were factors apparently missing from the life of my father and you need to learn from them to make your own wise choices in this life. Number 9 in the list was my father’s mistakes and again you need to learn to not repeat them. I just gave you two O.T. examples where they made right choices and lived a longer life and my father’s N.T. example where he failed to receive correction from the Lord and died. This is about the time I can hear people try to say “we are not under that covenant and the Old Testament does not apply to me”. Don’t be ignorant and speak where you have no knowledge. There are too many things that you don’t know to say the O.T. does not apply to you. Everything that was revealed by God in the New Testament was first concealed in the Old Testament. The O.T. is nothing but the N.T. covered and the N.T. is nothing but the O.T. exposed! They are practically identical in many corresponding ways with one being totally a natural pattern in the Old and the other being a totally a repeated spiritual pattern in the New. What I am attempting to teach is that if the fear of God existed in the O.T. it clearly must exist in the N.T. or God has changed. Act 13:16 Then Paul stood up, and beckoning with his hand said, Men of Israel, and ye that fear God, give audience. The Bible teaches us to let every truth be established in the mouth of two or three witnesses. Therefore, I wanted to show you that the “fear of God” is directly mentioned in the New Testament in more than one place. Pay close attention to see that these verses were written to Christians living in the age of Divine Grace and that they were written for us to learn from and to follow. Did you notice what the first verse in my list in Acts 13:6 said? Wasn’t Paul one of the first “Grace” preachers? Who was Paul preaching this message of Grace to? Did you see it? Paul was preaching grace to Christians in the church that first and foremost “feared God”? I thought Paul was the ultimate grace preacher that everyone today likes to claim to preach like? I have heard more than one of these modern day Grace preachers say that Paul got blasted by people in the church for preaching grace claiming that he was giving them a license to sin. However I noticed a major problem that is not lining up in the N.T. with this modern day grace message, did you see it also? Why are these modern extreme grace preachers NOT following Paul’s example in Acts? Why do these modern grace preachers speak to men that do not fear God and still claim to be like Paul? I believe that is one of the most profound things that I have taught you today. Is your preacher teaching people that fear God? If not the preacher is wrong or the people are wrong and do not fit the pattern given. Jesus Christ is the revealed Head of the Church (Eph 5:23). If you do not believe my words or Paul’s words that the fear of God is still a factor for your salvation, why don’t you begin to believe the words of your God? In this verse Jesus clearly says “fear God” and do not “fear man”. Do not fear those that can only kill the body but not your soul but fear Him that is able to do both. This command will become significantly more important as I continue to teach. Remember these words! This verse is a statement not addressed directly to a people by name but rather by implication applies universally to every human saved or unsaved. Those that do not wish to believe the “fear of God” command was spoken to them will attempt to explain it away as a statement spoken only to unsaved Jews. However, if you read the context you should be able to see that this statement was made to the disciples of Jesus and that means the words apply to the future church more than they apply to the lost world or Jewish people but both are still relevant since none of the disciples were yet saved when this was said. Consider the audience that received this message was mixed with those that feared God and those that did not. Was not Judas present with the 12 when this was spoken? Eleven of these disciples of Jesus became founders of the church but one betrayed Jesus because he lacked this quality called the “fear of God”. Judas witnessed the same miracles of Jesus as the other 11. Judas heard all the same preaching and teaching messages that the other 11 heard. Judas saw Jesus walk on water, calm the storm and so much more. But clearly Judas lacked the important feature of the fear of God and regrets that eternally in hell today. Act 5:11 And great fear came upon all the church, and upon as many as heard these things. What did this verse just say? Not only was there “fear” in the early church there was a “great fear” and that just intensifies the terror of God level to a much higher plateau. The Greek word used here in this verse is again G5401 that was used to describe the disciples in the boat observing Jesus walking on the water. Clearly from the verse context this was a result of what just transpired within the church. What caused the early church to be in such excessive terror of a loving gracious God? Ok, maybe I should first ask you who were these fears in the church people directed at? The verse does not state directly who or what this fear is of or for, therefore these words can be explained away to be a fear of something else besides God. This is where one grace preacher unfriended me on FB. I simply told him that he knew how to read the Bible but that he could not see what the Bible really said right in front of him. In order to answer this question we need to study the context of the verse and find out what God teaches in the surrounding verses. Taking verses out of their context will allow Bible teachers to make them say what they want them to say but using the context to explain them is a wiser approach to correct Bible study. Go study the entire context of this verse. We should back up to begin reading in chapter 4. I’m not going to go through everything said verse by verse but I will give you a synopsis overview of what is occurring and what is important to notice. Reading in Acts 4:1 it begins with a description of the disciples preaching to the people of Jerusalem. They preached the resurrection of Jesus to the people and were put into prison in verse 3. In verse 4 you can clearly see that many people believed the Gospel and at least 5000 men were saved. Therefore we are observing the church is growing by preaching the Gospel. What was this Gospel message being preached? We need to go back further in the context to chapter 3 to see if it contained any message for the fear of God. Read chapter 3 and in verse 23 tell me what it says? Peter tells the people that Moses told them to look for another prophet from one of their brothers and this one will have a greater message for them to hear. Peter then says the words of this prophet called Jesus is for you to believe or to be destroyed. Do you believe that this message was a warning to the people? I can see where Peter says believe or perish and that was a clear warning statement of fear. What happens when a warning is given by a messenger sent from God like Isaiah or Jonah? Does fear play a role in the people receiving the message? Please observe what the message was that Peter was preaching and then try to figure out if that is anything like what is being preached in churches today. Peter very clearly says for these people to believe or to be destroyed in verse 23 and I never hear modern grace preachers saying anything like this. I guess they just don’t want to offend them into heaven so they flatter them into hell. Let’s go back to chapter 4 of Acts. If you continue to read down in chapter 4 of Acts you will see the leaders of the temple commanding Peter and John to never preach or teach in the name of Jesus anymore. Peter looks at them and says “Whether it is better to obey you or God, you judge” in verse 19. Clearly Peter was telling them we fear God more than we fear you and we will not stop. Isn’t this an example of Peter and John being a doer of the commandment of Jesus that I just gave to you? Do the disciples fear the leaders that can throw them into prison or do they fear God? The leaders of the synagogue finally relent and let them go and they return to the other church members and tell them what has transpired as a warning to them from men. They immediately stop and all pray together in one accord saying in verse 29 “Behold their threatening”. The disciples asked God for boldness to proclaim the truth in spite of these human threats to their life. It is very clear to me that these people in the early church feared God more than they feared man because in verse 31 it says God answered their prayer by shaking the place they were in. Let me explain to you what God was saying to them by shaking the ground. God was saying can these men that threatened you do this? That was God’s answer and I believe that is enough evidence to inform us who the early church feared and who they did not fear. So I’ll go back and ask you this question again about Acts 5:11, who did the early church fear in this context story? It was not any man, so it was either Satan or God. We could go through and prove that it was not Satan, but I am spending too much time trying to counter these false teachings so let’s just focus on the words that are written. Look at verse 33 in Acts 4 and find the subject of Grace. Act 4:33 And with great power gave the apostles witness of the resurrection of the Lord Jesus: and great grace was upon them all. Here we have another exponential growth in the Grace of God given to His church. Not only were they shown “grace” but God has increased the level of His grace to a greater degree. What we learn from this verse is that Grace is delivered in stages. If there can be “great” grace then there can also be “little” grace or even “no” grace. What do you believe is the main factor for the presence of this greater level of God’s grace in the church? I believe it was a combination of factors beginning with the presence of a “great fear” of God. The church being in fear of God while not fearing what man could do to them, increased the level of God’s grace being offered to them. Of course there are other factors that are also involved in this grace being given but we will learn those as we continue to study this subject. Act 4:35 And laid them down at the apostles’ feet: and distribution was made unto every man according as he had need. Verse 34 of Acts 4 is the opening of the story of Acts 5. Clearly the translators made a poor choice to divide the chapters at their current locations. Start reading in verse 34 and you will see God speaking directly about the church. He says those that were in the church lacked nothing because those that had were generous to give to those that did not have. That is the foundational context of what we need to know in order to understand chapter 5. We can clearly see who God is speaking of and speaking about in chapter 4 and this just continues in chapter 5. Man divided the chapters not God. So do not believe the chapter heading five starts a brand new story. Act 5:2 And kept back part of the price, his wife also being privy to it, and brought a certain part, and laid it at the apostles’ feet. Act 5:4 Whiles it remained, was it not thine own? and after it was sold, was it not in thine own power? why hast thou conceived this thing in thine heart? thou hast not lied unto men, but unto God. Act 5:5 And Ananias hearing these words fell down, and gave up the ghost: and great fear came on all them that heard these things. Act 5:6 And the young men arose, wound him up, and carried him out, and buried him. Act 5:7 And it was about the space of three hours after, when his wife, not knowing what was done, came in. Act 5:8 And Peter answered unto her, Tell me whether ye sold the land for so much? And she said, Yea, for so much. Act 5:9 Then Peter said unto her, How is it that ye have agreed together to tempt the Spirit of the Lord? behold, the feet of them which have buried thy husband are at the door, and shall carry thee out. Act 5:10 Then fell she down straightway at his feet, and yielded up the ghost: and the young men came in, and found her dead, and, carrying her forth, buried her by her husband. One modern TV extreme grace preacher tried to explain away this story of the early church by teaching what happened was God’s protection of the early church from the deception of two unsaved people. That was a very creative attempt to explain what was happening so that all of the words on the pages are totally ignored. Since this TV preacher could not give us any scriptures to back that opinion I call that a private interpretation unworthy for consideration. Go back and read Acts 5:1 through verse 10 carefully again and again until you see what is actually said. Attempt to confirm that this is just one example of what was explained in Acts 4:34-35 given to us by the inspiration of the Holy Ghost. We can see clearly from reading Acts 4:34-35 that Ananias and his wife Sapphira were both Christians doing what all the other Christians were doing with only one major exception being omitted. It is very clear to me that neither Ananias nor his wife feared God. Otherwise they would not have lied to the Holy Ghost as was revealed to us by Peter in Acts 5:4. Peter also said they “tempted” the Holy Ghost in verse 9. Peter was very clearly telling Ananias and his wife that they did not lie to men or tempt men, but God was the one that took offense at what they did and they both then fall dead in church. You do understand that this was a church service going on that lasted for hours and that Peter was given a Word of Knowledge by the Holy Ghost when God interrupted the service to bring judgment? Do you believe that both people just coincidently dropped dead in church at the exact appropriate time of rebuke of the preacher? What do you believe killed them? Was it a heart attack? I want you to notice something else here in this story. Both of their names are given to us by the inspiration of the Holy Ghost as examples for us not to follow. Do you recall in Luke 16 where Jesus gave us the story of Lazarus and the rich man? The name of the rich man in hell was never revealed. Why was that? Was it because the rich man’s name was not known by Jesus? I do not believe that is the case. I personally believe the rich man’s identity was protected so that his relatives would not know he went to hell. Why then does God give the names of Ananias and Sapphira if they go to hell? You see that is a problem to me. I do not believe that they went to hell. I believe they were saved by grace but that they were judged by God that shortened their time here on the earth. That explanation would fit more precisely with what I learned from my father’s life. Clearly God took the sin of Ananias and Sapphira personally and had to bring judgment so that those that remained living in the church would learn a lesson. After all what was the result of this event? Was it not the spread of a “great fear” in all of them that heard it in the CHURCH? Look at the results and tell me who caused this fear. Was it God, Satan or man? I can only attribute it to God by careful observation. Rev 14:7 Saying with a loud voice, Fear God, and give glory to him; for the hour of his judgment is come: and worship him that made heaven, and earth, and the sea, and the fountains of waters. What do these two verses say to you? I read them and they literally spoke volumes to me. After the church is taken up from the earth, the angels during the tribulation period will come to preach “the gospel” to the people still living on the earth that remained left behind. Did you notice what this Gospel message started with that was preached by the angels? Look closely again at verse 7 and see the angels commanding the people of the earth to change their attitudes and to finally begin to “fear God” before it is too late. It is very clear to me that these people on earth have no fear of God if the angels warn them they are lacking this quality. Then notice that there is coming a proclaimed judgment from God and both of these subjects are hardly ever preached or even mentioned by modern grace extremists. Why are the modern grace preachers teaching a gospel that is different from what the angels of God will preach? Who do you think is preaching right? Why have the modern grace preachers departed from the words of the Lord Jesus who established the church by His shed blood commanding us to “fear God”? Why have the modern grace preachers left the full teachings of Paul who preached to those that “fear God”? If the church age begins with a message of “the fear God” from Jesus, Peter and Paul and God ends the church age with the angels proclaiming the same message to “fear God” where is this message in all of the church services this Sunday? If your preacher never preaches about the “fear of God” you have the wrong preacher. People seriously need to wake up and see the truth. I do not understand or tolerate irresponsible people very well, but clearly many of today’s preachers are either very unwise, ignorant or extremely deceived. Since I did not call anyone’s name do not accuse me of speaking about you! However, if the shoe fits wear it. I’ll probably not make many new friends with this grace lesson introduction, but I am writing it from my heart. Look beyond your offense and learn what God says on the subject of the Fear of God and His judgments. I think I have gone long enough in this Bible lesson and will end it here. I hope that you understand why I introduced the subject of the fear of God in the study of the grace of God more clearly now. In the next lesson on grace we will expand the subject and learn God’s definition of Grace by studying additional displays of His Grace. I pray that you will help me spread this very important message to those that need to learn it. If that is your preacher point him to my website and ask him to read it. If that is your congregation then preach it boldly to them so that they hear the message clearly. Learn to fear God and not man and watch God’s Grace increase in your life. If you want to see “great grace”, learn to do what God says. Until next time may the knowledge of the truth of God continue to increase in your life. God Bless you! Posted on February 19, 2013, in Bible Study, Grace, Understanding and tagged Bible, Christianity, Church, Fear, God, Grace, Holy Spirit, Jesus, Religion, Truth. Bookmark the permalink. 8 Comments. God is blessing me with His Truth through your teaching! Thank you for your obedience to Christ and may He continue to shower you with grace and increase your wisdom! I was a professing Christian for 21 years and by His grace I was born again just over 2 years ago at the age of 37! One of the first things I desired was to know more people that were true followers once He opened my eyes. You articulate so well what I have been struggling to understand myself. How do they miss the truth that is written right there in black and white and red? Thank you for all your devoted time and effort in sharing the Truth! You’re a blessing! You are the blessing. I appreciate your comments and diligence to study the Bible to seek after God’s truth. God will be there to confirm His word always. God Bless you. A very good teaching and totally truth.. we in the church today need to hear this..There is very little fear of God … Grace is not a license to sin but Grace is what God gives us to help us not to sin.. Thank you for your kind comments. I could not agree more. God has been answering my questioning through you. I’ve believed in God’s grace and love and always wonder if the wrath of God is really true since He loves me. Instead of fearing God I lived as I pleased because I have believed Jesus has paid for my sins so no responsibility on my part. This is very insightful and will always thank God for directing me to your website. May God continue to bless you and increase you greatly. Grace and peace be with you and your family. Thank you. I found this to be thorough in full detail but I still have no idea what is required of us as the BRIDE OF CHRIST, I really want to know so I can be completely obedient can some1 please answer this for me, what must I do? What does it mean when God Himself has asked you to be His bride???? Thank you so much I enjoyed this lesson immensely . Grace goes along with fear not what we may think ,(afraid )but it calls for reverence .